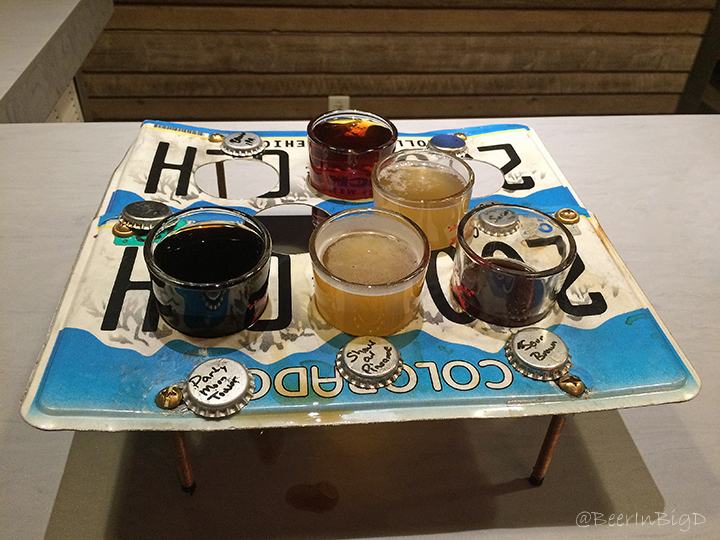 Flights at HopFusion are $8, with servings consisting of four 4-oz pours (© Brian Brown/Beer in Big D). 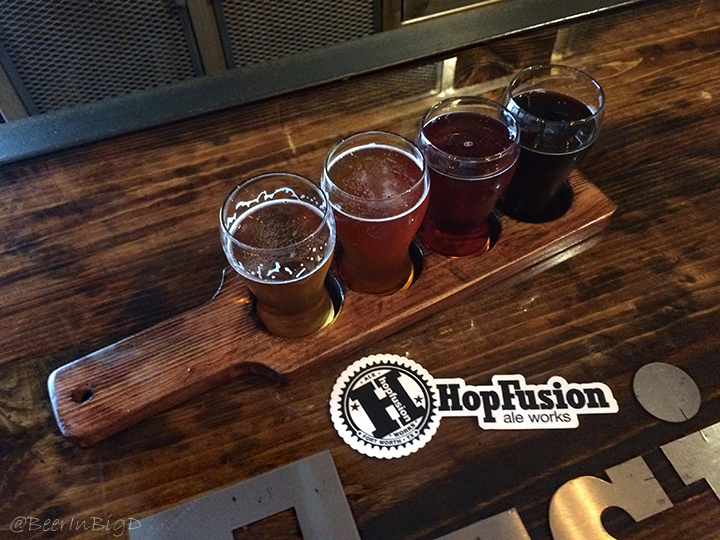 Completing the final leg of a journey that began in late 2014, this weekend HopFusion Ale Works hosted the grand opening of the taproom at its brewery in Fort Worth. Located at 200 E. Broadway Avenue, the venture is situated in the city's Near Southside district. 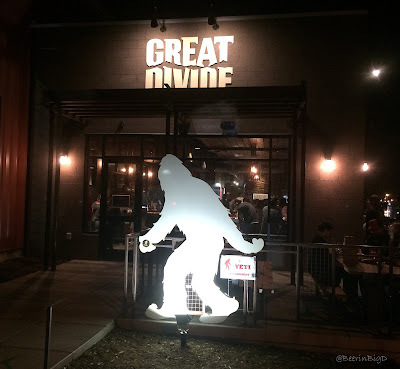 It's an area of town that has become a sort of brewing epicenter, considering it's also occupied by the likes of Rahr & Sons Brewing Co., Chimera Brewing Co., and The Collective Brewing Project. HopFusion beers have been on the market since June, but founders Matt Hill and Macy Moore had to overcome a series of hurdles before opening the brewery's doors to thirsty North Texans. With that milestone now achieved, HopFusion will be open for business Thursday-Saturday, with the eventual goal of being open six days a week. So, what can you expect if you decide to make the trip? Well, to begin with, the building is hard to miss should you find yourself wandering the streets without a map. 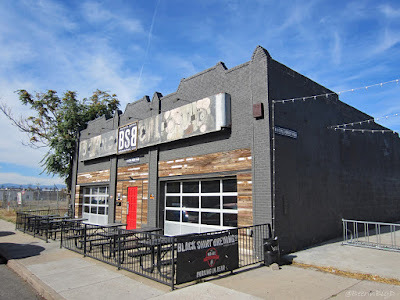 With a predominantly white exterior and contrasting black trim, HopFusion's home stands out like a craft beer beacon compared to surrounding structures in that part of the city. Inside, though, the space takes on a different sort of glow with a warm, sort of wood grain and graffiti motif enveloping imbibers hanging out in the taproom. Left: The taproom at HopFusion is equipped to serve as many as 20 different beers (© Brian Brown/Beer in Big D). off to the side able to be raised for a more open feel (© Brian Brown/Beer in Big D). Speaking of which, indoors is probably where you'll want to be to get the best view of a wall-size widescreen TV off to one side of the space, but musical morsels emerging from the bandstand are easily within earshot of patrons seated inside or out. Either way, there's roughly the same amount of seating whether you prefer the inner ambiance of the bar and brewhouse or the open-air feel to be had out on the deck. As for what the brewery will have to offer, a total of seven beers were on tap during opening weekend, with the list including both commercial releases and a handful of taproom exclusives. HopFusion's bar has space for a total of twenty beers, though, so it's assumed that more selections will be added over time. 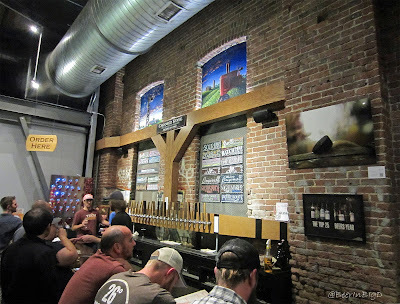 Regarding the types of beers HopFusion is making, with the exception of a saison, the brewery's current lineup consists of mostly modern takes on American styles. Everyday beers, dubbed the Signature Series, include the names Feisty Blonde, Fur Slipper, Hairpin and Steampipe. Thoughts on those are provided below (based on samples had at a launch event during North Texas Beer Week at LUCK), as are notes on last weekend's taproom-only offerings. Feisty Blonde (honey vanilla blonde ale): If I've ever had a more honey-forward beer, I don't remember it. In fact, many "honey" beers don't smell or taste like honey at all, since honey characteristics tend to ferment out as yeast consumes the liquid's fermentable sugars. In this case, though, orange blossom honey leads in a beer that also features background notes of vanilla, brown sugar and spice. Hairpin (rye pale ale): Dry, flavorful pale ale with a noticeable rye component and a moderate finishing bitterness. Steampipe (black rye IPA): While I can't completely discount the influence of drinking Hairpin right before this one, my initial reaction to Steampipe was that I got more of the roasty, dark malt flavor than I did the rye. It's there, just seemingly more subtle, adding a hint of complexity to what is otherwise a well-crafted black IPA. Fur Slipper (imperial milk stout): Smooth, easy drinking milk stout that belies its imperial moniker, with toffee and hazelnut flavors complimenting the beer's dark chocolate underbelly. Les Fauves (saison): The name refers to a group of "wild beasts" composed of 20th century French painters known for their bold use of color. 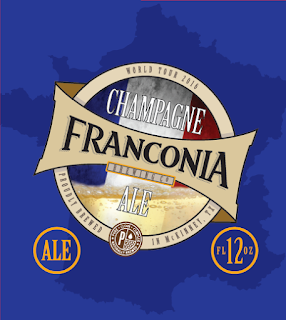 It fits, of course, due to HopFusion's artistic influences and the fact that the saison style has origins in Wallonia, a French-speaking region of Belgium. The interpretation here is brewed with ginger and hibiscus flowers, which results in a funky and floral farmhouse ale boasting a bit more body than a typical saison. Ahuevo (double IPA): I'd probably want to drink this one again on a fresh palate to flesh out the hop flavors, but a first impression reveals a strongly-hopped, resinous DIPA balanced by an ample malt backbone. Zombie Crack (imperial milk stout): A version of Fur Slipper aged on charred oak with roasted pecans, the nuts are front and center in terms of the flavor profile. They also likely play a role, along with the wood, in giving the beer a touch of tannic dryness. Rahr & Sons Brewing Co. of Fort Worth has announced it will release two seasonal specialty beers this month, both of which are based off the brewery's popular Winter Warmer recipe. 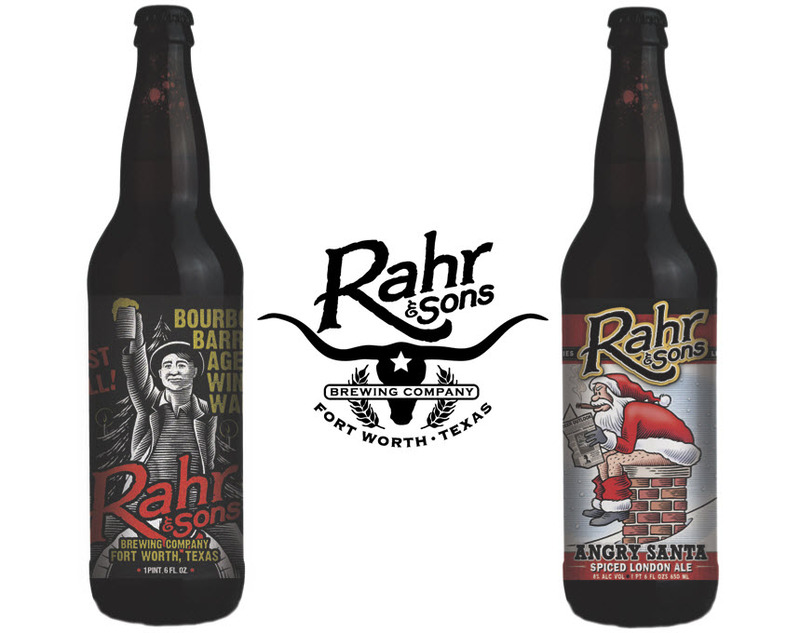 The first of these is Bourbon Barrel-Aged Winter Warmer, a beer that has become a North Texas tradition since it kicked off the brewery's "To Thee" series in 2010. As has been the case in prior years, the beer will once again feature updated label artwork, with the 2016 edition sporting a red, gold and metallic silver design that incorporates a static hologram. As for the other beer, Angry Santa will be packaged in bottles for the first time after appearing as a limited draft-only product last year. Crafted with mulling spices, vanilla beans and honey to create a brew reminiscent of gingerbread cookies, it's a beer that Craig Mycoskie, vice president of brewing operations, based on baking recipes. "The gingerbread baking philosophy gives Angry Santa a sweeter taste than Bourbon Barrel Aged Winter Warmer, though both are equally delicious," says Mycoskie. "We use ingredients in both beers that are typically associated with the holidays and nicely compliment the notes found in our Winter Warmer English dark ale." According to a press release, each beer will be the featured pour at an upcoming tour at the brewery, with Bourbon Barrel Aged Winter Warmer being poured Wednesday, November 23, and Angry Santa scheduled to be served on Wednesday, December 21. The two beers will also be available on tap and in 22-ounce bombers at establishments around the Metroplex. Images courtesy of Armadillo Ale Works. 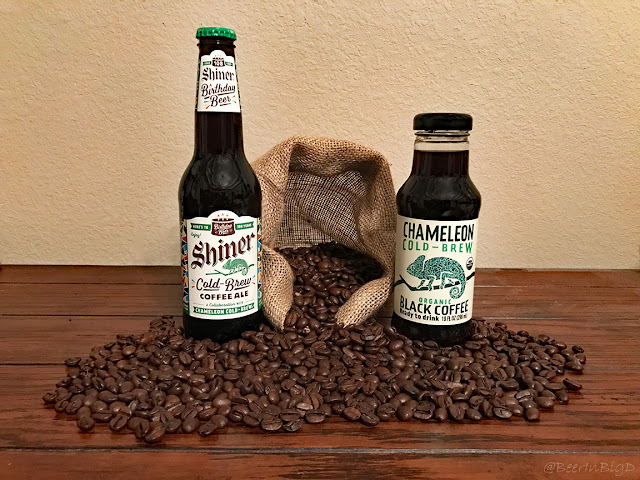 Since Armadillo Ale Works re-appeared on the North Texas Beer Scene in August, hardly a day has gone by without a question as to when the Denton-based brewing company would be bringing back some of its original brews. "Soon" is what founders Yianni Arestis and Bobby Mullins would say when asked about the status of Brunch Money, Greenbelt Farmhouse Ale and the award-winning Quakertown Stout (gold medal, 2014 Great American Beer Festival). The pair chose to kick-start Armadillo's comeback with new recipes like Honey Please, a honey-forward blond ale brewed with mesquite beans, and Dapper Apple, a beer you might say drinks like a bowl of apple cinnamon Cheerios. But now the time has come for the return of the brewery's first three recipes. "People are really digging both of our new beers, but of course they keep asking us when their old favorites are coming back," says Arestis, "so we thought North Texas Beer Week was the perfect time for a limited draft-only release." Some will no doubt wonder about the "limited release," tag, but that simply has to do with the fact that Armadillo is currently brewing its products on a part-time basis at North Texas Brewing Co. in Grapevine. 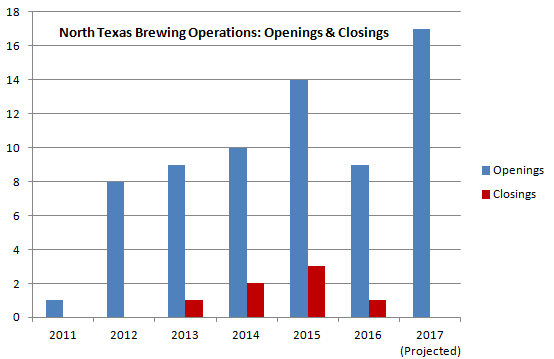 Once the brewery's permanent home in Denton is up and running, though, fans can expect these beers to be back in the fold on a more regular basis. 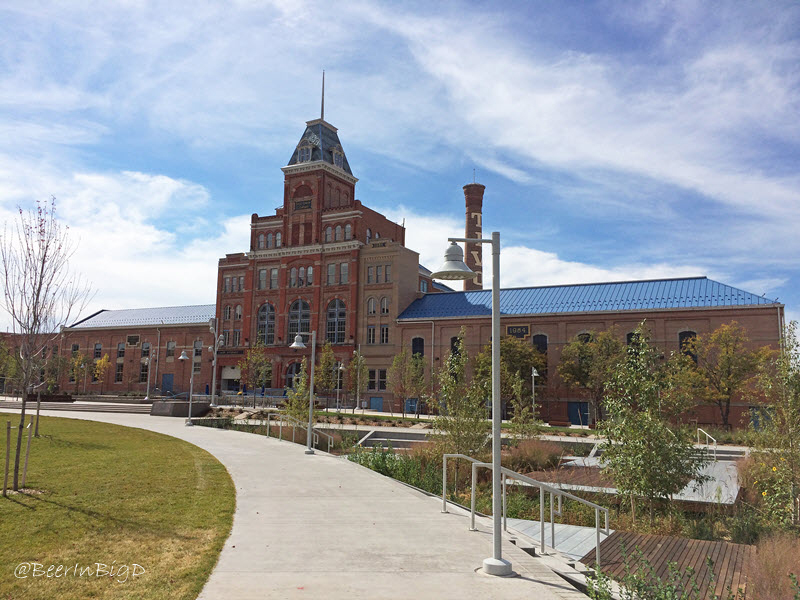 "Construction at the brewery is in full swing and we are aiming to open early next year," explains Arestis. "When that occurs, we plan on bringing them all back in various capacities, but we really wanted to make this happen now for everyone who misses the old beers like we do." As for where and when you'll be able to enjoy a pint of an Armadillo original, a schedule of special tappings is provided below. However, take note that additional events are still being added, so be sure to follow the brewery's social media channels for the most up-to-date details. Oak St. Drafthouse, Denton - 6-10 p.m. - Brunch Money Release Party, with glassware while supplies last*. Dapper Apple, Greenbelt Farmhouse Ale, Honey Please and Quakertown Stout will also be available. Untapped Dallas, Fair Park - 2:30 p.m. - 12 a.m. - Sampling Brunch Money, Dapper Apple, Greenbelt Farmhouse Ale, Honey Please and Quakertown Stout. Thirsty Growler, The Colony - 2-10 p.m. - Snapchat Takeover (24 hour session) featuring Brunch Money, Dapper Apple, Greenbelt Farmhouse Ale, Honey Please and Quakertown Stout. Midway Craft House, Denton - 8-11 p.m. - Pint Night/Tap Takeover featuring Brunch Money, Dapper Apple, Greenbelt Farmhouse Ale, Honey Please and Quakertown Stout. 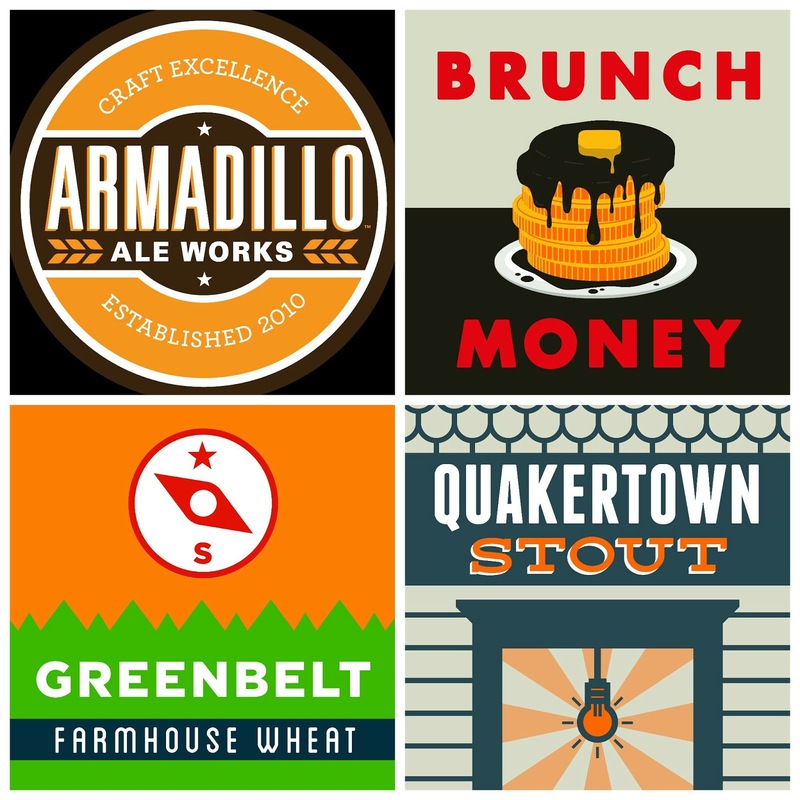 East Side, Denton - 1-4 p.m. - USBG Denton (members only) Presents Armadillo Ale Works featuring Brunch Money, Dapper Apple, Greenbelt Farmhouse Ale, Honey Please and Quakertown Stout. East Side, Denton - 6-9 p.m. - Tap Takeover (public event) featuring Brunch Money, Dapper Apple, Greenbelt Farmhouse Ale, Honey Please and Quakertown Stout. Taps & Caps, Denton - 7 p.m. - Hip Hop and Brews featuring Brunch Money, Dapper Apple, Greenbelt Farmhouse Ale, Honey Please and Quakertown Stout. Drunken Donkey, Denton 7 p.m. - Tap Takeover featuring Brunch Money, Dapper Apple, Honey Please and Quakertown Stout. Omni Hotel, Dallas - 7-10 p.m. - North Texas Beer Week Brewer's Ball featuring samples of Brunch Money and Honey Please. The Bearded Monk, Denton - 8 p.m. - A Night of Armadillos, with glassware while supplies last*. 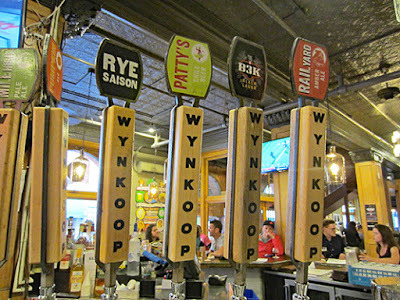 Brunch Money, Dapper Apple, Greenbelt Farmhouse Ale, Honey Please and Quakertown Stout will be on tap. 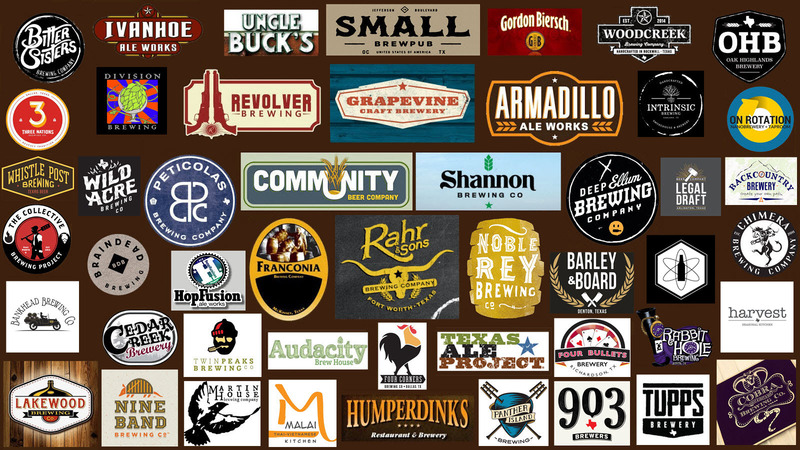 According to the latest numbers, there are nearly 300 events at over 100 venues on the bill for North Texas Beer Week. Yet, based on past experience, the most unique and intimate of them all will happen on November 18 at the Omni Hotel in Dallas. Back for its third annual edition, the 2016 Brewer's Ball will bring together founders, owners and brewmasters from 45 breweries, giving you a chance to rub elbows with the men and women behind some of the most popular local and national brands available in North Texas. While doing so, you'll be able to choose from a selection of 90 beers, conveniently listed below for your viewing pleasure, 27 of which are of the barrel-aged variety. And, if you want to talk about the "strength" of the beer list, over a quarter of the selections have an ABV of over 10% (so, naturally you're advised to plan ahead and drink responsibly). 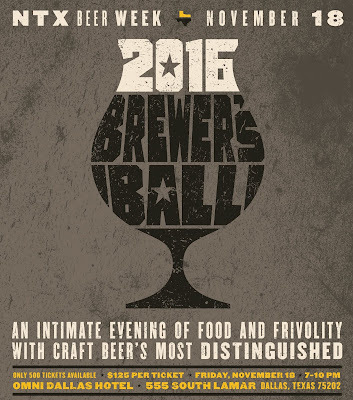 Tickets for the 2016 Brewer's Ball are $125 (click here to purchase), with the total number available capped at 500 attendees. That price includes unlimited beer samples (i.e. no festival tasting cards), as well as noshes for nibbling provided from a dozen of the area's top beer-centric restaurants. Also of note, this year's festivities include a free pre-party and live broadcast on SportsRadio 1310 The Ticket. Taking place on the lawn of the Omni Hotel, the gathering will feature a special toast by Dallas Mayor Mike Rawlings. Copyright © 2016 The Beer Goddess. Today, it's all about the stout. That's because it's International Stout Day, a celebration of dark, decadent brews that got its start in 2011. So, in the spirit of that, I offer up a short synopsis of stouts that have been available at different times in North Texas history. Hey, it's what I do...I read old books and newspapers to learn how our scene has evolved. 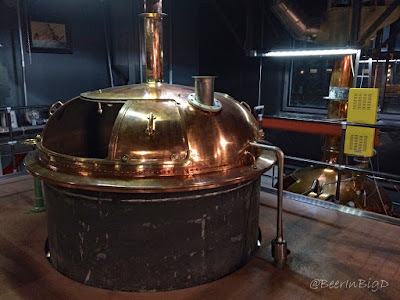 Sometimes such explorations also involve the consumption of beer...and more often than not, what I'm drinking is exactly the kind of rich, roasty and/or chocolately brew that inspired the creation of the day. North Texans were drinking stout, or at least a kind of beer that would evolve into what was called a stout (more on that in a moment) as early as 1873. "Brown Stout Porter" could be found for sale at area grocers alongside imported lagers and Scotch ales. Many early listings don't credit the brewer, but C.G. Hibbert of London was likely the bottler of the stout porter advertised, since regular shipments from the firm were arriving at the Port of Galveston during the same period of time. Dallas Daily Herald (Dallas, Tex. ), Vol. 1, No. 42, Ed. 1 Sunday, March 30, 1873, newspaper, Dallas, Texas. (texashistory.unt.edu/ark:/67531/metapth279736/: accessed November 2, 2016), University of North Texas Libraries, The Portal to Texas History, texashistory.unt.edu. 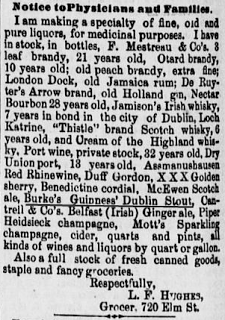 With regards to that other famous stout, Guinness was being sold early on by locals as well (purportedly for medicinal purposes), though it doesn't appear in Dallas newspaper ads until around 1881. Shipments to Galveston show Guinness being sent to Texas by 1865, but it's not clear when it was first stocked in North Texas. Many times the beer was billed as Burke's Guinness Dublin Stout, due to the fact that Guinness didn't bottle its own products until well after Prohibition. Back then, they used a network of bottlers to package and ship their beer to America. Edward and John Burke, who were grandsons of Arthur Guinness, owned one such distribution company and the U.S. was their largest market. "Imperial" is the new "stout"
It's true! Well, sort of. 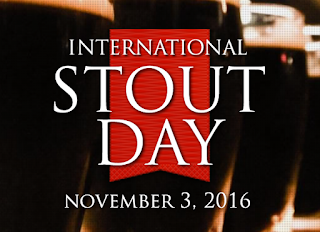 During the 1800s, stouts actually grew out of a stronger version of porter usually referred to as "stout porter." Nowadays, whenever a brewery releases a stronger version of a particular style, they add the imperial tag (imperial IPA, imperial saison, imperial brown ale, etc.). So, if you think about it, given the seemingly similar style guidelines between porters and stouts, in today's lingo a stout could also be called an imperial porter. Looking at things in those terms, you might say "imperial" is the new "stout." Copper Tank - Mocha Madness Coffee Stout, gold medal in the Herb/Spice Beers category at the 1998 Great American Beer Festival. Two Rows - Imperial Stout, bronze medal in the Imperial Stout category at the 2000 Great American Beer Festival. Something worth noting about these two beers is that the brewers involved in their creation are still active in the brew scene today. Jon Sims, formerly of Four Corners, Oak Highlands and Texas Ale Project (but, now working at Wynkoop in Colorado), was an assistant brewer at Copper Tank in 1998, while Mike Kraft, currently the director of brewing operations at Wild Acre, was running the brewhouse at Two Rows in 2000. 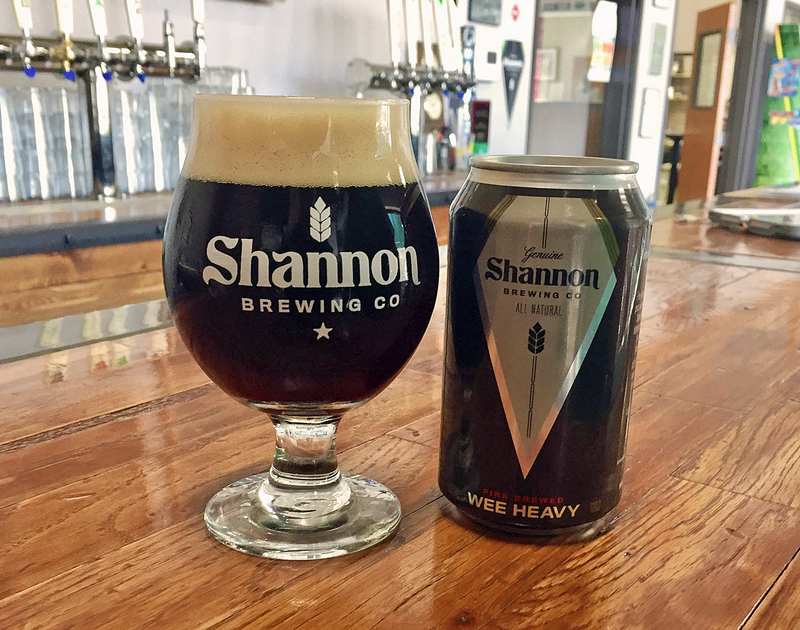 The first locally-crafted stout beer and whiskey blend? 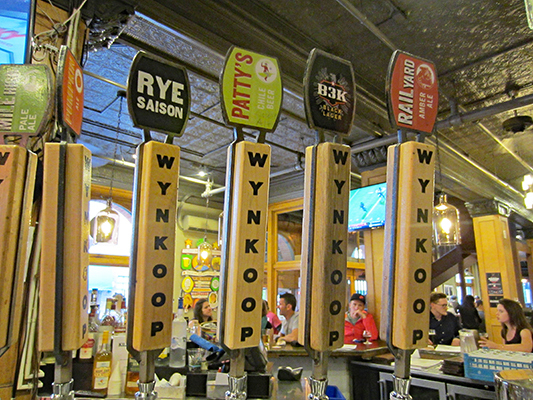 Speaking of Two Rows, that brewpub might have been considered ahead of its time based on one beer it produced. Years before barrel-aged beers would become commonplace, Two Rows whipped up a beer and bourbon blend called Wild Turkey Stout. If memory serves, it hit taps sometime around 2003, and much like the stronger beers of today, it was served in a smaller vessel due to its higher ABV. 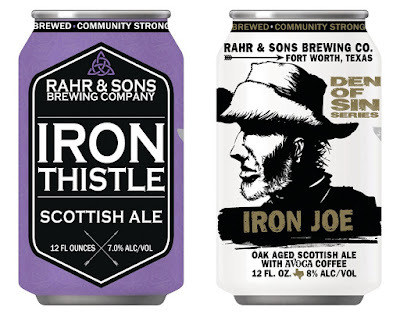 After the year 2000, Fort Worth's Healthy Brew included a stout in its organic lineup, while Great Grains of Dallas was brewing Wildcatter's Crude Stout, a recipe they licensed from the by-then defunct Yellow Rose Brewing Co. of San Antonio. The Covey in Fort Worth had one as well, called Smokestack Stout. That beer won a silver medal in the Smoke-Flavored Beer category at the 2009 Los Angeles International Beer Competition. Then, of course, came Snowmageddon, an imperial oatmeal stout that commemorates the great roof collapse that occurred at Rahr & Sons in 2010.
was singled out as a Gold Medal winner by the Beverage Tasting Institute. Left: Armadillo's Quakertown Stout won gold in the Imperial Stout category at GABF in 2014. 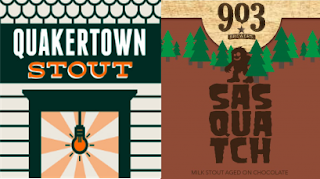 Right: Sasquatch from 903 Brewers won silver in the Aged Beer category at GABF in 2015. As for the here and now, North Texas currently has a plethora of obsidian offerings. Most are familiar with names like Community Legion, The Temptress from Lakewood and others, but let's not forget about the two locally-brewed stouts that have brought home major awards during the current craft beer renaissance (see details in the caption above). 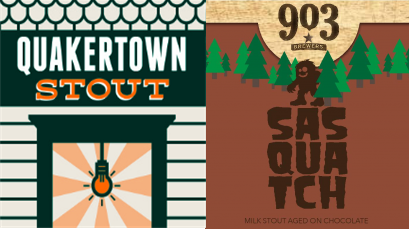 One, that being Sasquatch from 903 Brewers , is likely stalking your local store shelves as we speak. And, the other? That would be Quakertown Stout, the product of Denton-based Armadillo Ale Works...a beer that will re-appear soon. Labels: 903 Brewers, Armadillo Ale Works, barrel aged beers, Community Beer Co., history, Lakewood Brewing Co., North Texas, Russian imperial stout, Stout Day, stouts, Wild Acre Brewing Co.